All of us love different sandwiches, burgers and other bread and meat dishes. Each kitchen has its own differ in ingredients, methods of preparation and taste, probably. In Italy, an absolute favorite is panini – a closed sandwich with a filling. The variety of panini depends on what is in the fridge and your imagination. It can be closed sandwiches at once with several fillings (ham, sun-dried tomatoes, cheese), with pates, with sauces (cheese or pesto). From the Italian language Panini is translated as "a small bread roll". But to be quite accurate, in Italy, a sandwich called panino imbottito (literally "stuffed panino"). The main rule is to serve hot! Let's make a basic panini, the BLT sandwich (Bacon, Lettuce, Tomato). 1. You can take any meat ingredient – bacon, ham, sausage, but even fried meat or cutlet. I chose chorizo (spicy pig sausage with paprika, thanks to which it has a characteristic taste and color). As for the bread it is best to use ciabatta or similar white bread. The most important secret of a good panini is to smear olive oil on pieces of bread on both sides (the inner one will give a juiciness to the filling, and the outer one will be very well baked). 2. Cut all the ingredients as for an ordinary sandwich – thin slices of 0,3-0,5 cm. Also you can choose any location of layers. I made cheese, tomato, lettuce, chorizo, marinated peppers. If you like a lot of cheese – put two layers. Here are good soft cheeses that will melt and stretch – mozzarella, cheddar. 3. It remains to bake panini. For this purpose, a grill pan is ideal, there are even special panini presses (devices like favelniki, but with grill bars), or even a simple frying pan. To cheese better melt and connect the ingredients among themselves – panini is better to press down a little. To do this, put a flat plate and some load on top. For 3-5 minutes on each side, until the characteristic formation fines. 4. 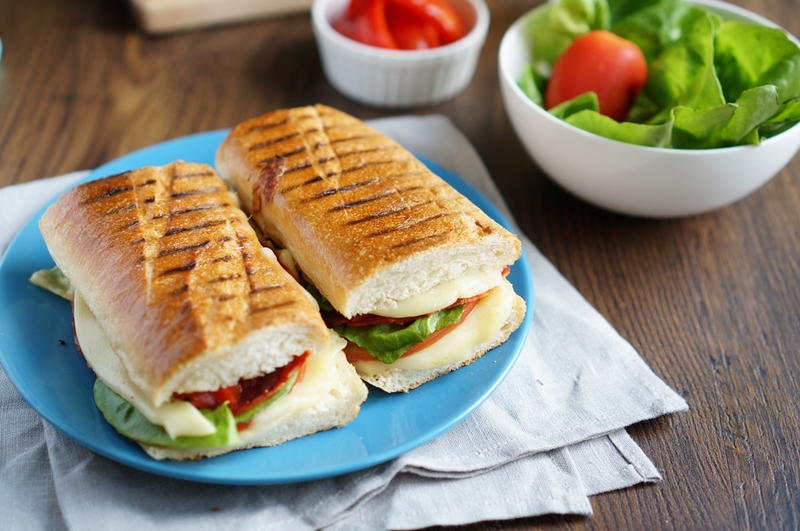 Serve panini hot, if you need to make a large amount – keep it ready in the oven or on an extra hot frying pan. And you can just reduce the size of an individual portion. Bon appetite!